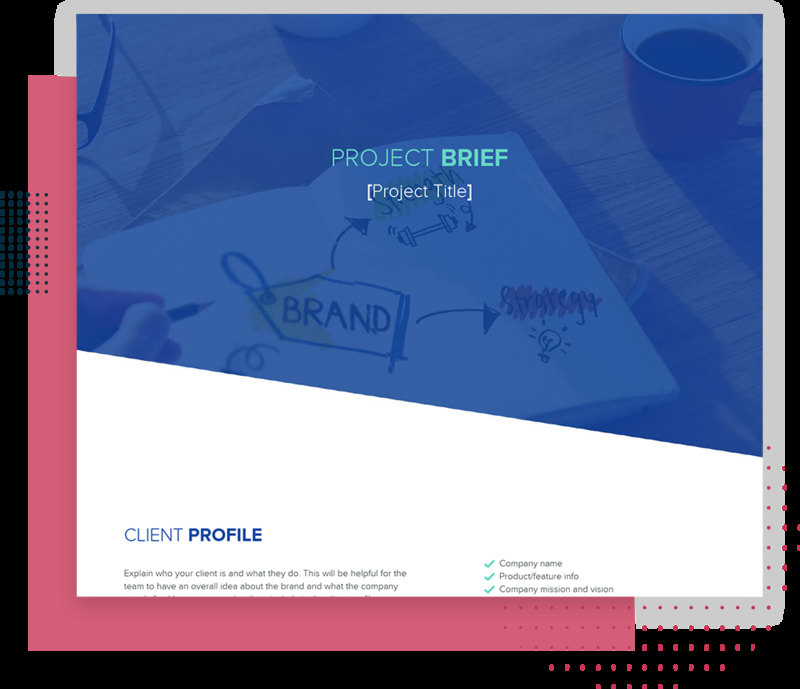 Simply put, a project brief (project proposal or project plan) is a starting point for any project – whether it’s to plan an internal website update, organize a full-blown client campaign or outline a school project. It’s a key document that outlines the scope, scale and detailed requirements of the project, helping you reach your goals faster and more efficiently. 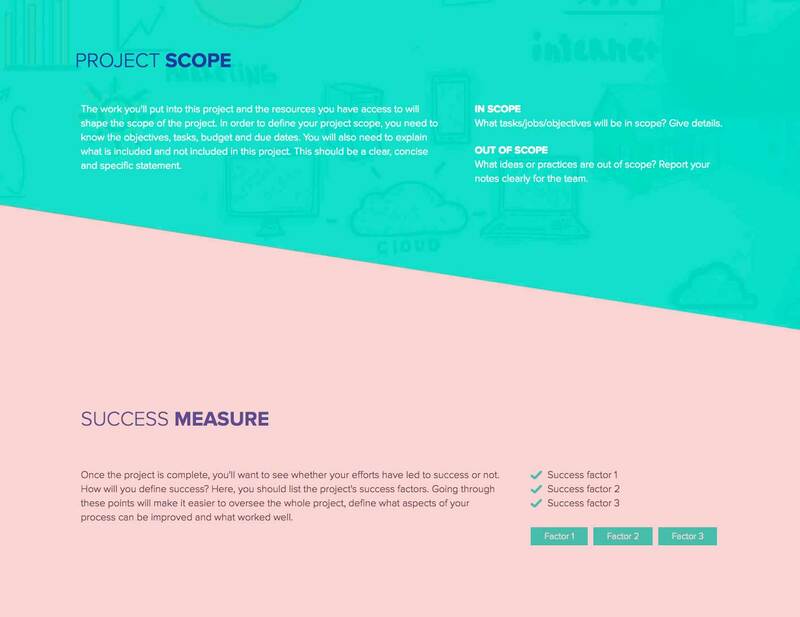 Create a Project Brief - It's Free! Your starting point to create and share a successful project brief, without any design experience. The length of a project brief depends on the scope and scale of your project. The more intricate the project is, the longer the brief will be. Let it come together naturally by adding information as you need. Don’t worry about the format or following a certain outline, a project brief can and should change depending on the purpose. The great thing about using Xtensio’s Project Brief template is that it becomes an editable living document once you save it to your dashboard. Move modules and sections around to make the template fit your project. Collaborate on it with your team members and share the live link with your clients to keep them updated on the project as it evolves – no sending PDFs or constantly updating a web page in the CMS! 1. Company Profile: Who is your client? What is the client’s company name? What does their product/service focus on? What are the main features of their product/service? What is the company’s mission and vision? 2. Project Description: What is the project about? Give an overview of the project by defining the what and the why. Describe what this project is about. Are you redesigning a website? Building a new product? Outlining a school research project? Define who will be in charge of the different processes your team is responsible for on this project. What are some of the critical details and requirements the client mentioned? Find out why your client is tackling this project. Understanding what motivated them to get the ball rolling will help you identify potential roadblocks in the project. Quick Tip: Meeting the project requirements plays a large role in measuring the project’s success. Having detailed information about the project and your client’s profile will help the whole team understand their individual expectations in meeting these requirements. 3. 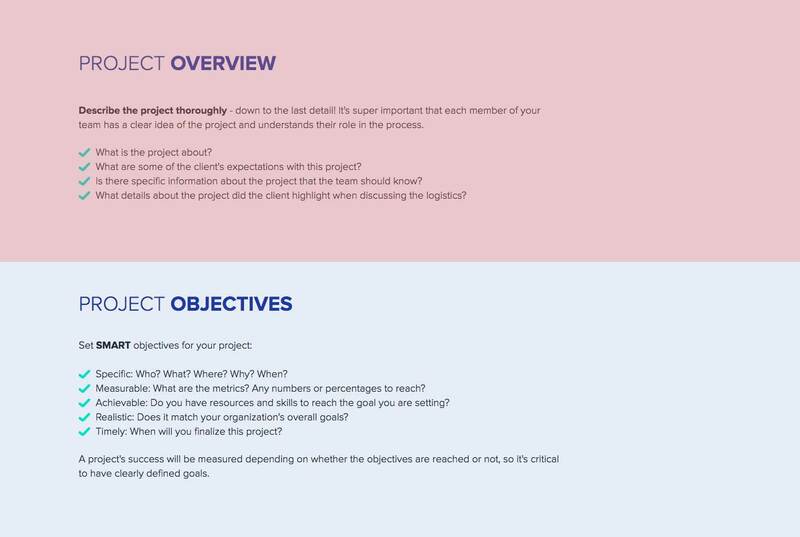 Project Objectives: Are they SMART? ✓ Specific: Who? What? Where? Why? When? ✓ Measurable: What are the metrics? Any numbers or percentages to reach? ✓ Achievable: Do you have resources and skills to reach the goal you are setting? ✓ Realistic: Does it match your organization’s overall goals? ✓ Timely: When will you finalize this project? 4. Target Audience: Who is the user persona? If you want to reach your goals and complete each milestone efficiently, you will need to create personalized projects and be familiar with the target audience. Before putting too much effort into the bulk of the project, you will need to learn who your client’s target audience is. What is their demographic? What are their interests and goals? In many cases, clients will provide you with insights on their users. 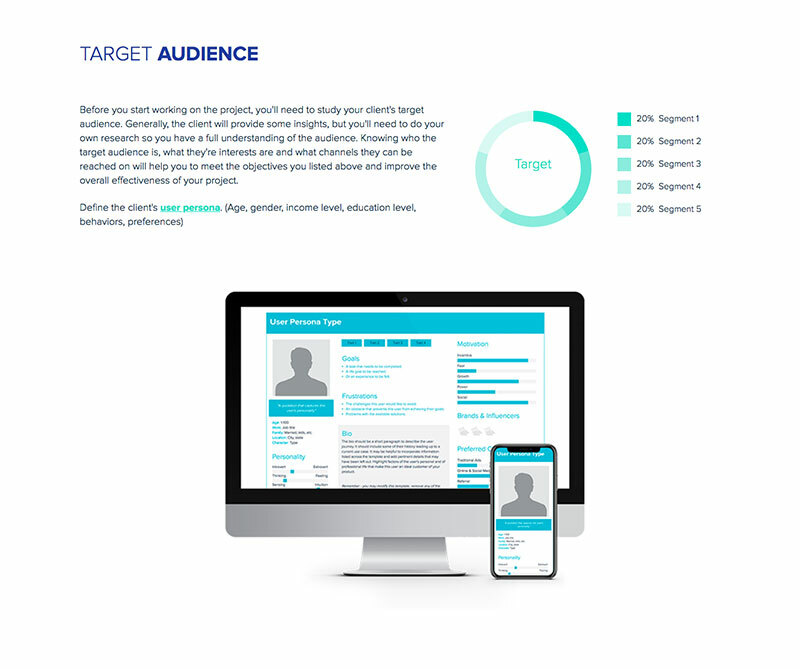 Bonus: If you are looking for the quickest and most effective way to create a user persona, share it with your team and integrate it into your project brief, take advantage of Xtensio’s Free User Persona Template! 5. Schedule & Budget: When and how much? One of the most important parts of organizing a project is identifying the final due date and scheduling your team’s efforts to reach specified milestones along the way. You should also establish the budget of the project in detail to avoid any last-minute expenses. What is the expected date (by the client) for this project to be finalized? How do you plan to manage the internal organization? Your team members need to be aware of the project timeline so they can meet the deadlines for their part in the project. What is the overall budget for this project? Are there certain aspects of the project this budget has been set aside for? Clearly outline how this budget will be spent on the project. 6. Project Scope: What is (not) included? Every project needs a well-defined scope in order to be successful. Defining what is in scope for the project should outline the project deliverables, features, tasks, objectives, budget and due dates. On the other hand, you should also identify tasks, jobs or processes that are out of scope, or not relevant to your team’s work on the project. What tasks/jobs/objectives are in scope? Explain in detail. Are there internal and external deliverables that are expected from the team or the client? Is there an important event date or iterative implementation dates that need to be met? What deliverables or tasks are not included in the project? If your client says they will provide all creative assets for a web design project, this task would be out of scope for your team’s work on the project. What are some ideas or practices that are out of scope? Quick Tip: Defining the project scope is a very important step for internal planning. Team members should have a clear understanding of what they need to take into consideration and know the details of what they shouldn’t be losing time with. 7. Success Measure: How will you define success? Did you meet the client’s expectations? What feedback did your team receive? Did you meet the deadlines and project milestones? Where do you see room for improving efficiency in your team’s process? Did you go over the budget? Or did you have money left over that could have been spent to improve the functionality or resources used in the project? Most importantly, did you reach the goals you set? Projects are ongoing… and project briefs are documents that regularly need to be updated. You will need to report changes or notify others once a step is completed. 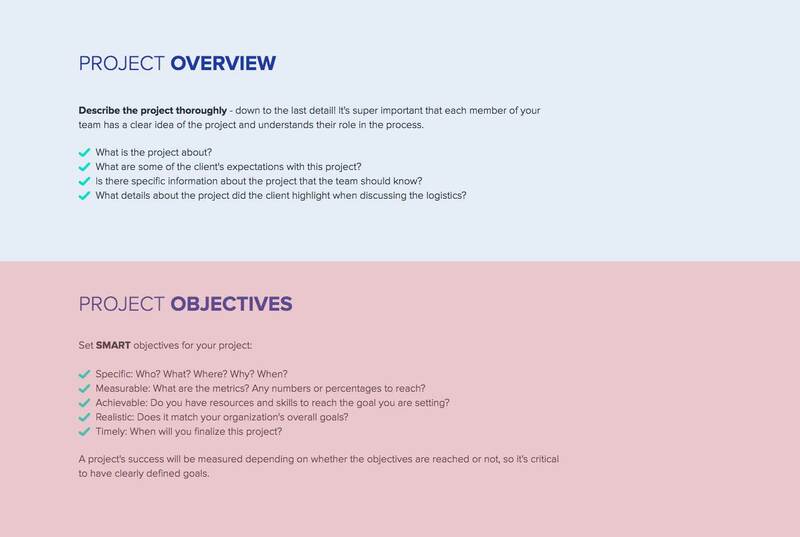 The project brief template is adaptable just like other Xtensio tools, it can and should be repurposed, revisited, and revised to suit your evolving needs. You can always add, delete, and move your modules and sections around with Xtensio’s versatile editor to adapt the project brief as you need it and anyone with the link will see the most recent updates.